Maximizer, Equalizer, Multiband Dynamics, Multiband Stereo Imaging, Post Equalizer, Multiband Harmonic Exciter, Reverb, and Dithering. 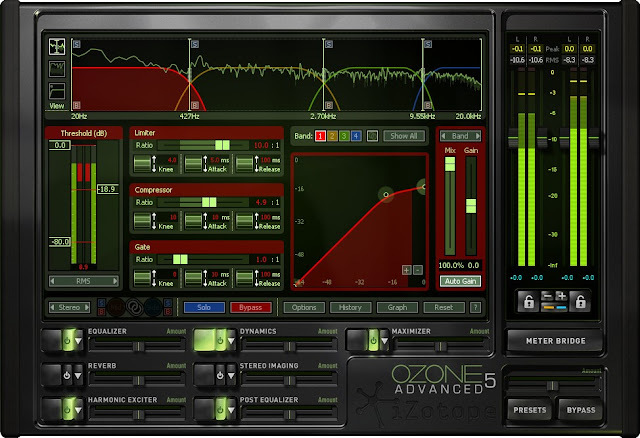 Ozone 5 Advanced adds 6 additional component plug-ins, extended features in every module, and an entire suite of configurable meters. Now you have the power to sculpt your guitar sound like never before. Mix mics, cabinets, reverb, EQ curves, and more with ease at levels of performance unrivaled by any other convolution plug-in. te lo borron !! ponlo otra vez porfis T^T !! !